Barrie Green's response to the WRG challenge is an N gauge layout designed for dual use with both American and British models - and is actually smaller than 3 sheets of A4 as it was built inside a sewing case. Bob Mason reviews and uses the Bachmann model on his Hazel Wood Paper Mill layout. Edward Beal describes the third version of his West Midland Lines layout, looking at structures and changes. 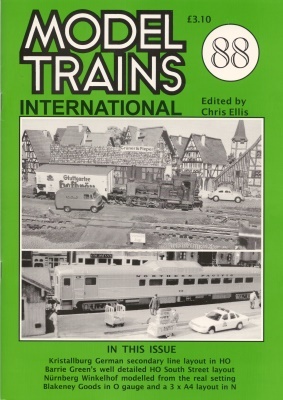 This article originally appeared in the September and October 1933 issues of Model Railway News. Chris reworks his Kristallburg layout resulting in much improved realism and better operating potential. A minimalist first venture in O scale (7ft 9in by 15in) used to try out feature of O scale and new scenic textures. John looks at some termini worth modelling, looking at the GWR station at Princetown in this issue.